DeepTech4Good#Stuttgart is organized in cooperation with the Photonik-Forum Baden-Württemberg. More information and the programme can be found here. To enrich your visit to the Stuttgart region – one of the EU’s major manufacturing hubs – we would like to draw your attention to a special offer of our European activities: A Guided Tour at the trade fair VISION 2018 on 8th November 2018 from 10:00 to 13:00. The trade show is the world’s leading fair for machine vision and thus a highly specific part of the photonics industry. A range of state-of-the art products and services are presented – from sensors to processors, from cables to cameras, from software to illumination systems. Complete machine vision systems and very specific applications for many different industries are exhibited – from mechanical engineering and the automotive industry through to the medical technology industry. The tour includes the possibility to take part in the international business matchmaking event organized by the Chamber of Commerce and Industry (IHK Region Stuttgart) in collaboration with Business Beyond Borders (BBB), an initiative supported by the European Commission. Companies can register for the Guided Tour on the business matchmaking platform https://vision2018.b2match.io without charge using the key word DEEPTECH4GOOD. Free tickets for the trade fair VISION are also available at the Photonik-Forum and at DeepTech4Good#Stuttgart. Are you looking for cooperation with corporates? DT4G#Stuttgart offers a platform for collaboration between start-ups and large corporates to fast track the development and introduction of breakthrough technologies. 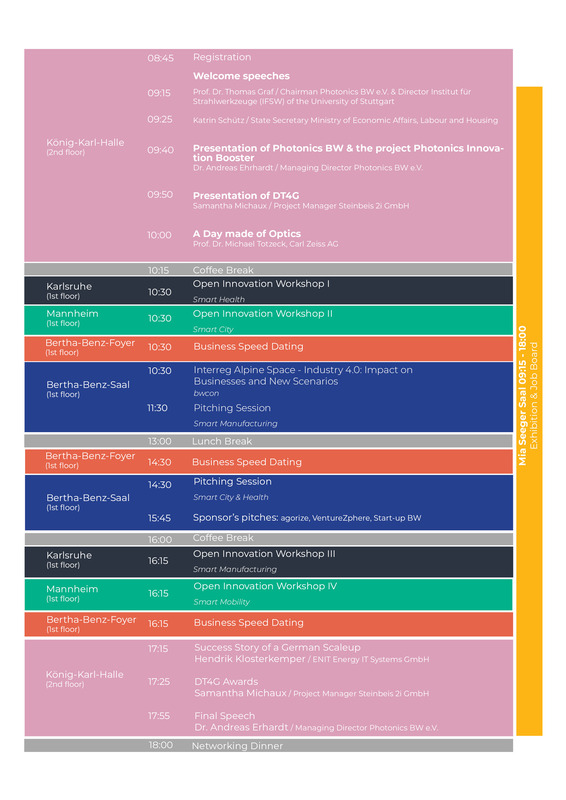 The Open Innovation workshops focus on capitalizing the innovative potential of IoT/Deeptech technologies for the sectors of smart mobility, smart city, smart health and industry 4.0 by analysing the value chains and identifying the gaps. The sessions follow a multi-actor approach in order to close knowledge gaps and create new opportunities for economic partnerships between stakeholders along the value chain. By focusing on technological axes of the IoT sector like connectivity, autonomous cars, HMI, AI, etc…. the value chain analysis will provide an overview of key players in a given market and offer the possibility to detect opportunities through the matching of know-how, meeting the market needs. Horizon 2020 is the research and innovation program of the European Union to maintain Europe’s competitive advantage in key technologies. H2020 finances multidisciplinary consortia, involving at least 3 European countries, with a total allocation of 30 billion euros. 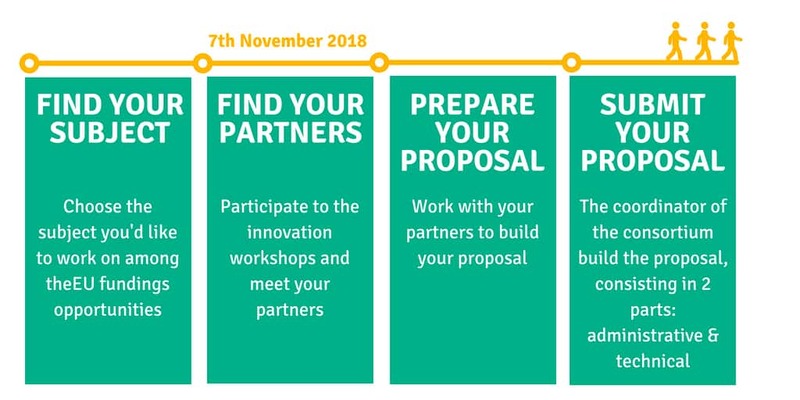 DeepTech4Good, a H2020 project, offers you the opportunity to find qualified partners in order to form a consortium around the relevant topic and submit a proposal to the European Commission.